Basically since my last post to tonight life has been full of surprises. Gramman, thank you for alerting me of my 5 day absence. I fully intend to get back in the swing of things. I'm glad someone missed me in the Blogosphere. 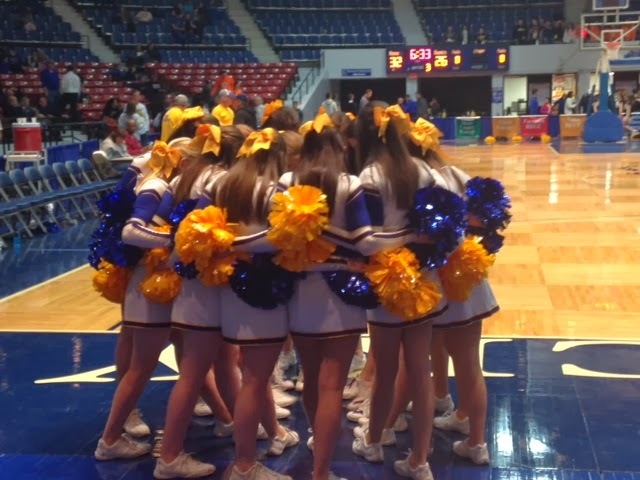 Thursday had me traveling from Paducah to Frankfort, KY with 16 cheerleaders in tow (I'm a Varsity Cheer Coach for a local high school) for a basketball tournament that our Varsity Boys were playing in. We weren't expected to win (Surprise! ), but what an exciting time for the school when they did. These are my sweet cheer babies - they are precious and I love being their Coach. I love you girls, but that last quarter was painful to watch. I took some candid photos. Would you like to see yourselves NOT smiling? [pull out iPhone for show-and-tell] Your job is to SMILE, during and between cheers. If you don't want to smile, perhaps you need to reconsider being a cheerleader, since that's a part of the job description. If you'd rather continue to be a grumpy cat, you need to head to the local humane society right meow. Saturday had me to trekking to Memphis early in preparation for surprising one of my BFF's Christin for her 29th birthday celebration on Sunday. 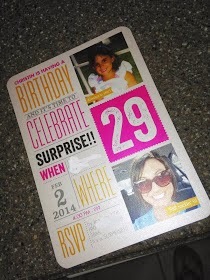 It all started two months ago, her husband started planning for her long-distance Besties (known affectionately, with her, as the COT or "Circle of Trust") to help surprise her for her 29th birthday. He sent out the most adorable invites. He invited her family, some of her dear Memphis friends and then of course the COT. There were several times we thought Christin had caught on to what was going on, so of course we played dumb and tried to help steer her off course. IT WAS SO HARD. We would be group-texting and then Kali, Mama and I would have separate threads at random points to discuss status of the surprise, etc. You see, Kali and I live within driving distance (we're both between 3-5 hours away) but Bri (we call her Mama) lives in Minnesota. Her husband is a pilot, so she was going to fly down on standby. The morning of, literally she didn't have a seat. Like Thank God she got on that airplane because one person didn't show up and I must say, I am SUPER THANKFUL that the person whose seat she sat in didn't decide to fly to Memphis Sunday. Sidenote - I really hope this person didn't die or get into an accident. 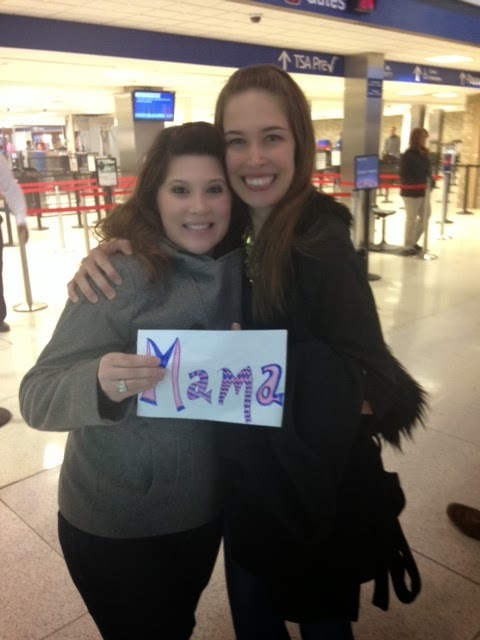 Weeks ahead of time, I told Mama I would make her a cheesy airport sign and I DID. We also had an epic airport meet-up. While waiting for Kali (she was driving in some wintry weather) Mama and I hit up a party store where we bought these ginormous pink sunglasses and a leopard print party hat for Christin. 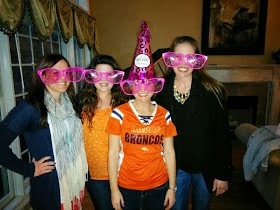 We didn't to rock the glasses into the house. On the way to Christin's, she was telling us about the surprise party and mentioning that the only people that were missing was the COT. At this point, the three of us decided that if Christin didn't cry, she totally knew that we were coming. So, Did she or Didn't She? C - I will never forget the genuine emotion you expressed in seeing us. You brought the biggest smile to my soul. Happy 29th birthday. I know this year will have so many incredible things in store for you. Blessed to be a part of your world. I love you. That's all. My life wouldn't be the same without you, and I'm a better person for having you as a friend. I could have written that comment. Ditto, C, Ditto.